Roger Dean Chevrolet Stadium is located on approximately 110 acres within the Abacoa Community of Jupiter. Abacoa is located on Donald Ross Road, approximately 1/4 mile east of Interstate 95. 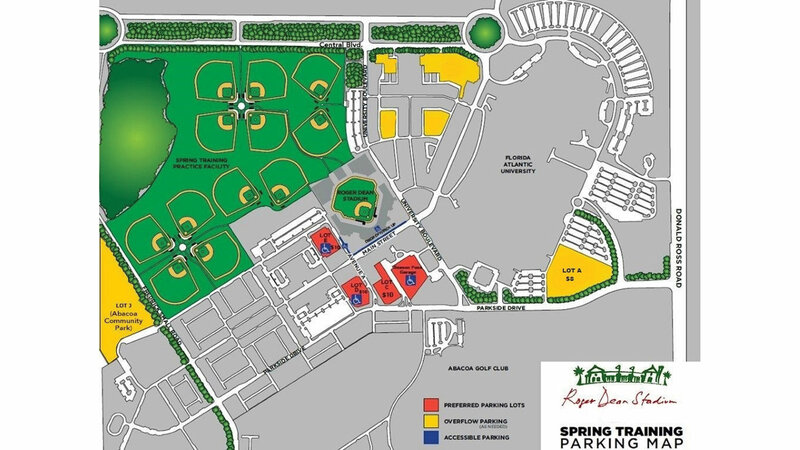 A $28 million Spring Training Complex that is specially designed to house two Major League Baseball teams, Roger Dean Chevrolet Stadium is the Spring Training home for the Miami Marlins and St. Louis Cardinals and house each organization's Florida State League Class A Advanced affiliates, the Jupiter Hammerheads and Palm Beach Cardinals. The ballpark features field box, loge box, bleacher, and bullpen club seating. 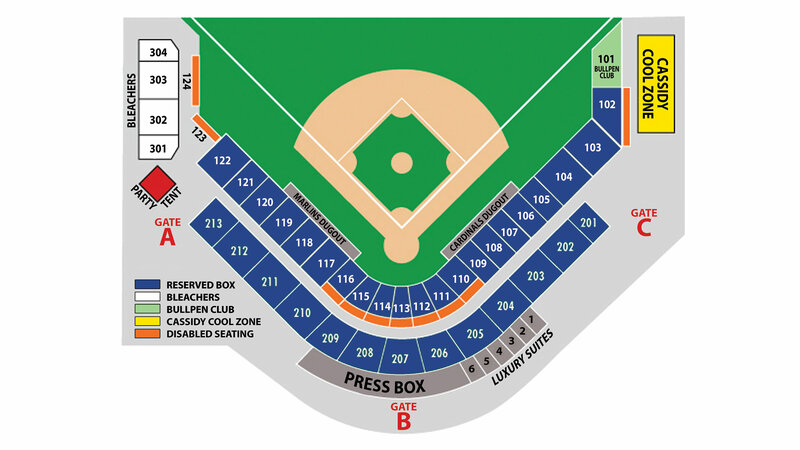 There are six luxury suites with indoor and outdoor seating and the Cassidy Cool Zone is the outdoor covered party deck area located in right field. The Bullpen Club is the stadium's newest addition featuring inclusive tickets with drink rail and four-top table seating and an all-you-can-eat grab-and-go menu. In addition, concession stands are located throughout the concourse with a variety of food and beverage options. For a more detailed A-Z Guide of all things at Roger Dean Chevrolet Stadium, please visit Roger Dean Chevrolet Stadium A-Z Guide. Capacity: The stadium accommodates approximately 7,000 fans featuring luxury suites, reserved seats, bleachers and bullpen club seating. The ballpark seats approximately 6,800 in its Reserved box level. Suites: Six air-conditioned luxury suites provide 320 square feet of interior entertainment including Wet bar, refrigerator, sink, ice maker, 50 inch LED television, bar stools, sofa and additional chairs. Each suite offers indoor and outdoor seating and are available with private entrance and elevator access. The facility is also the host to two of the largest high school baseball tournaments in the country each year, the USA Baseball Junior Olympic Tournament in June and the Baseball America/ Perfect Game Baseball Wood Bat Championship in October. Exit at Donald Ross Road (Exit 83) and travel east one half mile to Parkside Blvd. At the light, make a left and follow Parkside to University Blvd. Continue straight through the intersection and the stadium parking will be on your right. Preferred Parking: Single-game parking passes are available in the Abacoa parking garage (Season Pass Garage), and in three grass lots to the West and North of the stadium (Lots C, D & E). Parking in these areas is $10 per game (CASH only). Individual parking passes may be purchased at the Roger Dean Chevrolet Stadium ticket office, online at Tickets.com (Keyword: Roger Dean Chevrolet Stadium Parking) or by phone at (561) 775-1818.